In this tutorial, you will learn how to use simple electronic components and craft supplies to build a heart rate measurement sensor. You may be familiar with heart rate/oxygen sensors that clip onto your fingertip. These work by shining a light through your finger and measuring how much light makes it through. When your heart pumps blood out, your blood vessels fill with slightly more blood, which causes them to absorb more light. 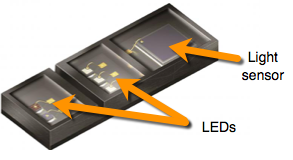 By using a sensitive light sensor, it is possible to detect and record these changes. The measurements taken by the sensor can then be used to calculate your heart rate. WARNING: The circuit/device you will build should NOT be used to make medical decisions! Medical grade sensors are rigorously calibrated and designed to produce consistent, accurate, and precise results. The materials used in the projects below, along with the simplified math employed, will result in a device whose accuracy and precision cannot be guaranteed. 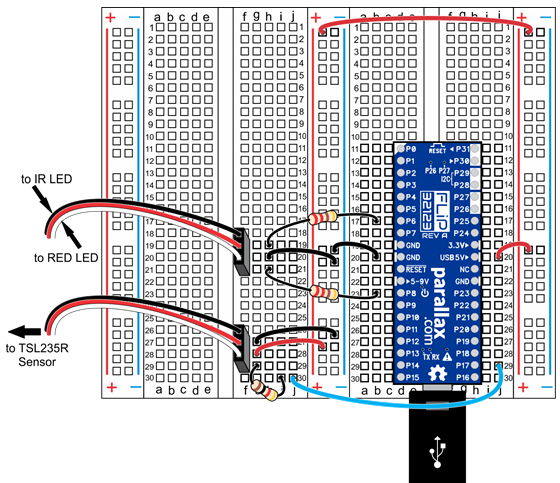 This project is only designed to teach you how these types of sensors and devices work. WARNING: Hot glue guns can cause serious burns if used improperly! A parent, guardian, or teacher should supervise you while you are using hot glue. Carefully and firmly push the LED leads into the other 3-pin cable. Both of the short leads will go into the center pin. Note which wire (white or black) that you plug the Red LED’s long lead into. Make sure the Activity Board’s power switch is turned OFF. 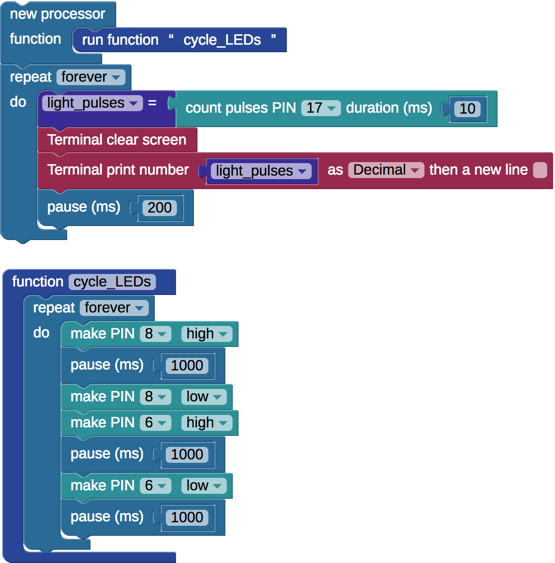 Create a new BlocklyProp project for the Activity Board or FLiP. [Activity Board] Make sure your Activity Board’s power switch is turned on to position 2. Click the “Load to RAM” button. Observe the LEDs and the Terminal output on your computer. The program works by turning on the Red LED for 1 second, then the IR LED for 1 second, then both off for 1 second. The Terminal will display the pulse count from the TSL235R sensor. 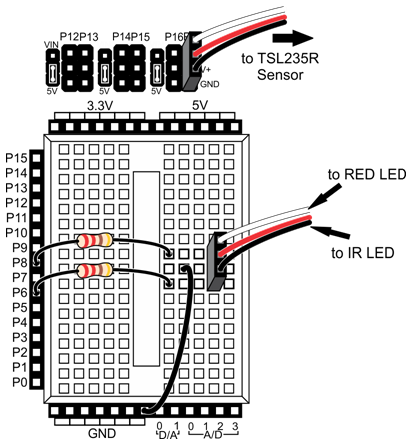 Hold the LEDs over the TSL235R sensor. 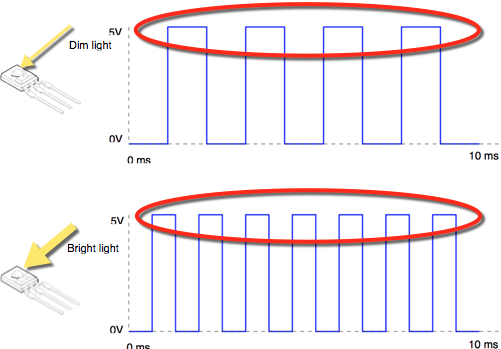 Observe how the value changes, and use the Terminal output to ensure that both LEDs are working correctly. Additionally, observe how much more or less sensitive the TSL235R sensor is to Red versus IR light. Make sure the connections are secure. If the connections from the LEDs or sensor to the 3-pin cables seem loose, you may need to put small bends in the leads of the LEDs or TSL235R sensor to improve the connections into the 3-pin cables. The test program works by counting the number of pulses detected by P17 in 10 ms. The more light the TSL235R detects, the higher the frequency output by the sensor. 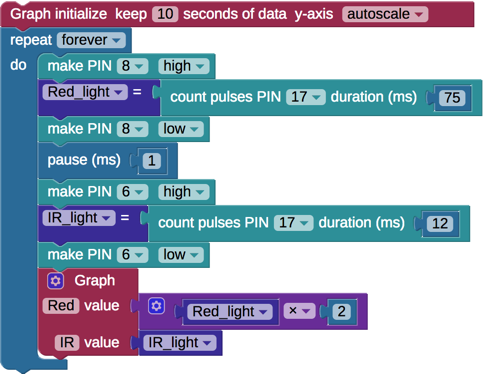 In other words, the brighter the light that comes through, the more pulses to count in 10 ms.
You can adjust the sensitivity of the sensor by changing the length of time measurements are taken over. Additionally, the TSL235R will be more sensitive to some light frequencies and less sensitive to others. Pretend that the TSL235R is 10 times more sensitive to IR light than Red light. You could measure TSL235R’s output for 10 ms while the IR LED is on, and for 100 ms while the Red LED is on - resulting in both measurements roughly equivalent. 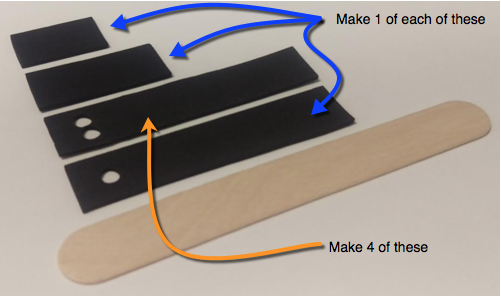 Cut out 7 strips of craft foam sheet 3 inches long and the width of the popsicle sticks. Glue the 1.5 inch (4 cm) strip onto the end of the other popsicle stick. Place the TSL235R sensor and it’s attached cable onto the 1 inch (2.5 cm) piece of foam, and glue the longer piece with the single hole over it (see picture below). WARNING: Do NOT place the rubber band too close to the sensor/LED end of the finger-clip. If the finger-clip pinches too hard, it will not work as well and could cut off circulation in your finger. You may need to adjust the position of the rubber band to make the sensor more sensitive or consistent. 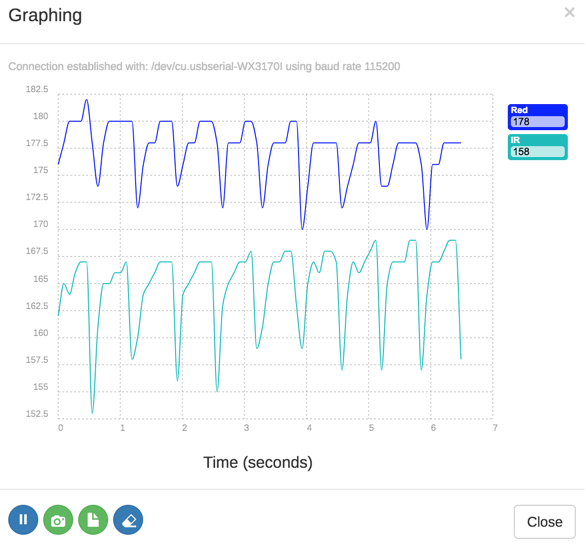 By graphing the output of the light-to-frequency sensor, you’ll be able to “see” how your heartbeat changes the blood flow in your fingertip. [Activity Board] Make sure you turn your Activity Board’s power switch to position 2. 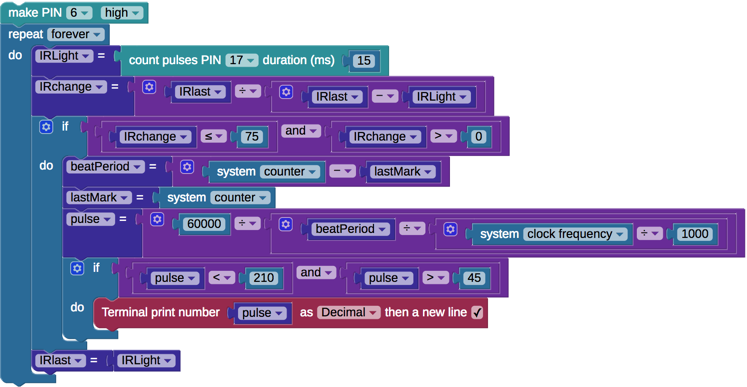 Place your index (pointer) finger into the device you built. Make sure the LED’s are shining into your fingernail. Load the program to your Activity Board or FLiP. You may need to adjust the pulse count duration values to capture blood flow more clearly. You may also need to use the “erase” button at the bottom of the graph window to clear the graph, which will re-scale it, making it easier to read. Look again at the example graph. By isolating the downward “spikes,” and measuring how far apart they are, it is possible to calculate your pulse. Additionally, the program below will only use the IR LED as it results in a more sensitive measurement. To isolate the downward spikes the program divides the difference between the current and last measurement combined with the last measurement - basically, it looks for a sizeable downward change. When the spike is detected, it stores a timestamp. When there are two timestamps, the difference between them is used to determine your heart rate in beats per minute (BPM). [Activity Board] Make sure you set the power switch on your Activity Board to position 2. Place your finger in the finger clip sensor with the LEDs shining into your fingernail. Load the program to your Activity Board. It may take a few seconds for a pulse rate to display in the terminal. When your blood is carrying more oxygen, the difference between the amount of red light your blood absorbs compared to the amount of Infrared light your blood absorbs changes. Using the first program from this activity, observe what happens to the two lines (Red and IR) when you breathe more deeply, hold your breath, exercise, or stay still.